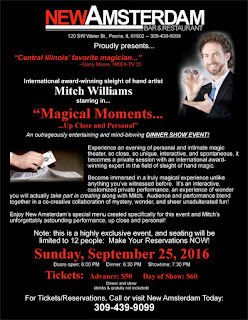 Here's an exciting announcement: back by popular demand, for those of you who missed my Magical Moments "up close magic theater dinner show event" at New Amsterdam in May, we're bringing it back for one show only on Sunday, September 25. If you reserve in advance, you can save $10 off each ticket that you purchase. This is a highly exclusive "up close and personal" event, and seating will be limited to only 12 people. Make sure you call New Amsterdam to reserve your tickets today!